The transient creatures that swarm and multiply in a drop of pond water. A video of a drop of pond water produced by Differential Interference Contrast Microscopy of pond water at 200-times magnification. I read “The War of The Worlds” by H.G. Wells as a teenager, and its opening lines (above) were my first, and career and practice defining, introduction to the wonder and hidden power of the microbiological world. In a sense, I have become Wells’ man with the microscope, scrutinising “the transient creatures that swarm and multiply in a drop of water” and a central theme of much of my practice is in revealing the activity of these usually invisible life forms. Figures 1A-C : Cryptoglyphs. 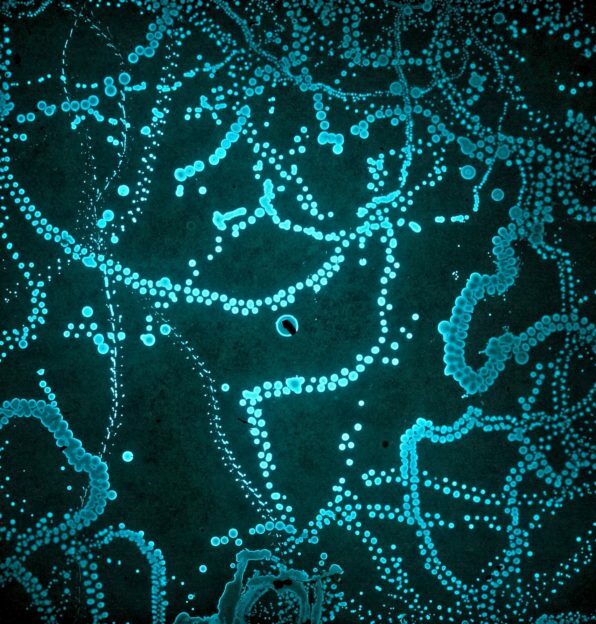 Tracks made by minute soil creatures called cryptozoa revealed by the growth of bioluminescent bacteria. The tracks after 1 day incubation (A) and then after 4 days (B,C). 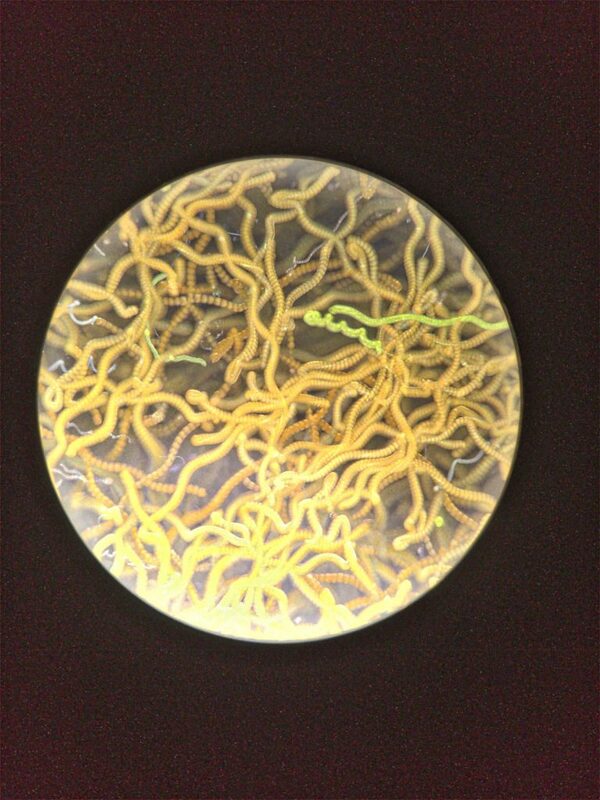 The next processes that I have developed for revealing invisible biological activities involves microscopic life forms even smaller than the cryptozoa. 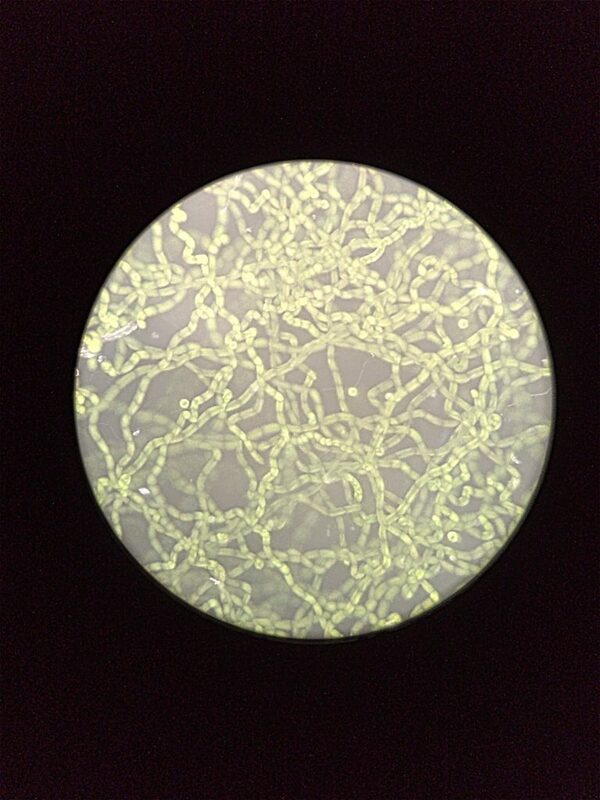 When infusoria are viewed using a microscope (at 200 to 400-times magnification), it becomes clear that these microscopic life forms are not simple at all, and that these minute creatures are able to decide whether life is getting better or worse, and respond by moving to more favourable conditions or away from harm. To better reveal this activity, and the complex dynamism of these life forms, I have developed another novel process, that rather than recording micro-videos in real-time, reports instead the paths taken by these microscopic creatures as they travel under the microscope. The images generated via this process, result from the accumulation of the activity tracks of the infusoria and reveal the hugely complicated dynamic of their manifold activities and interactions (Figures 2A-E). 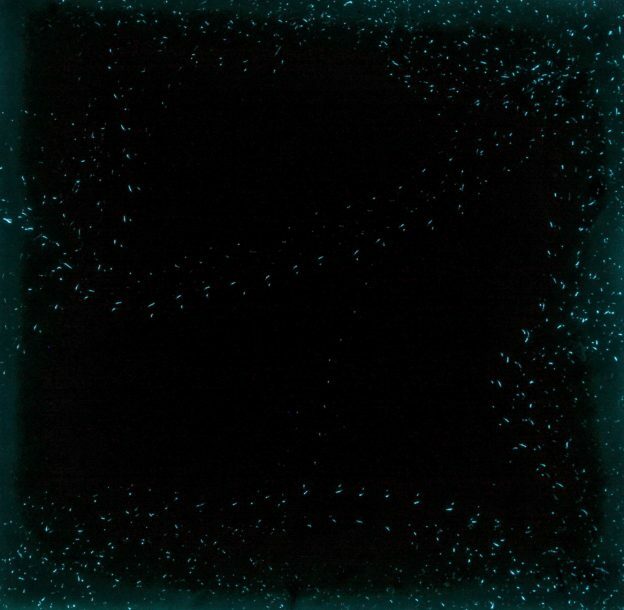 The process generates images or Microglyphs that are reminiscent of those of radioactive decay, or atomic particle collisions, as they are seen using cloud or bubble chambers. The process is transformative, in that it reveals the activity of a form of life that is generally considered to be mundane, and which often disregarded, into something remarkable, not by changing it, but by revealing another level of reality. It seems that each natural water course resonates to a unique energy signature of accumulated biological wavelengths and frequencies. 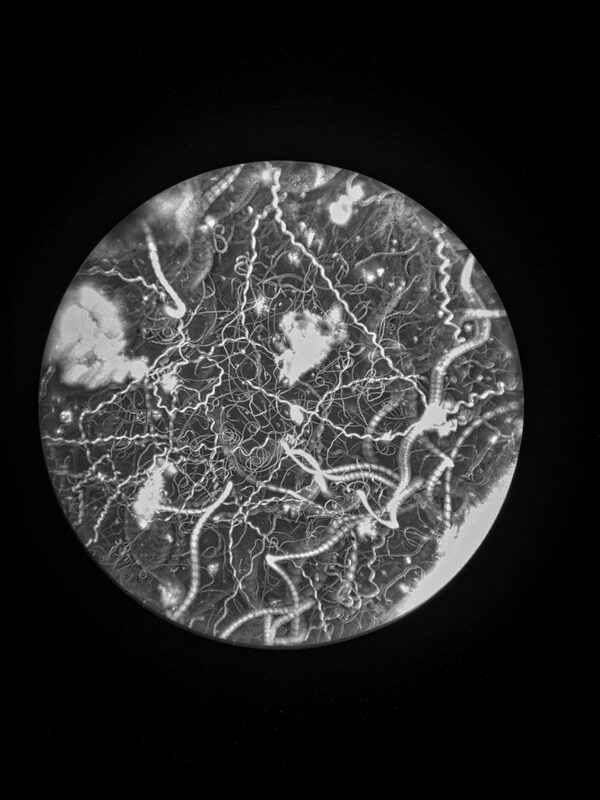 The final living media that I have worked with are bacteria, smaller still than the infusoria, and so much so that their individual cells are only visible at 1000-times magnification. I’ve worked as microbiologist now for over 30 years, and during this time our understanding of the microbial world, and particularly that of bacteria, has changed radically. When I began my microbiology undergraduate degree, bacteria were widely regarded as rather simple, ultimately selfish, and very uncommunicative lifeforms, and in this sense would seem to be very unlikely collaborators. However, the idea that bacteria were simple solitary creatures stemmed from decades of laboratory experiments in which they were grown under artificial conditions in the laboratory. 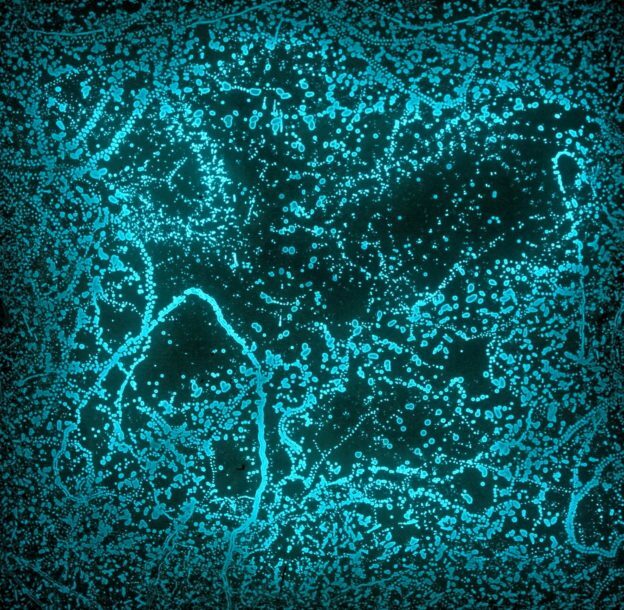 We know now that bacteria are able to communicate with each other using a process called quorum sensing, which enables bacterial cells to coordinate their behaviour, and which imbues them, like ants and bees, with a form of social intelligence. Moreover, quorum sensing allows these versatile and sophisticated life forms to work together in teams. Bacteria then are continually in dynamic communication with each other and are able to work together in teams together, to overcome obstacles to great for the few, to hunt prey as microscopic wolf packs, and to build biofilms and other complicated structures. 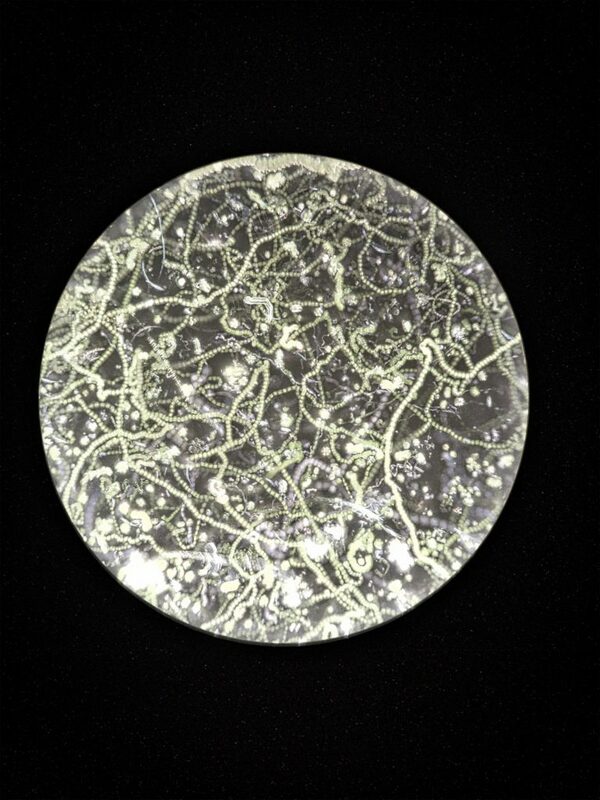 It is in this context that I see the bacteria that I use in my work very much as co-creators in the aesthetic process. My role is to understand the bacteria, their characteristics and capabilities, and then to provide the necessary environments which subsequently allow them to grow and then to flourish as independent creative agents. In this way I relinquish control over my materials and media, so that the final artworks are generated by autogenic processes that better reflect the reality of the natural world. Figure 3. Serratia marcescens. 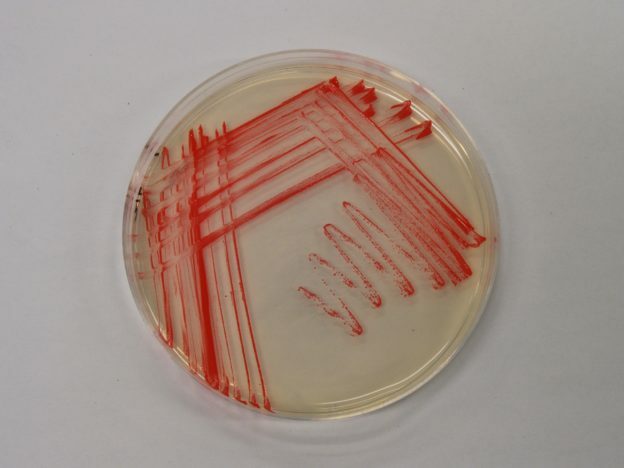 The naturally red pigmented bacterium growing on Plate Count Agar. 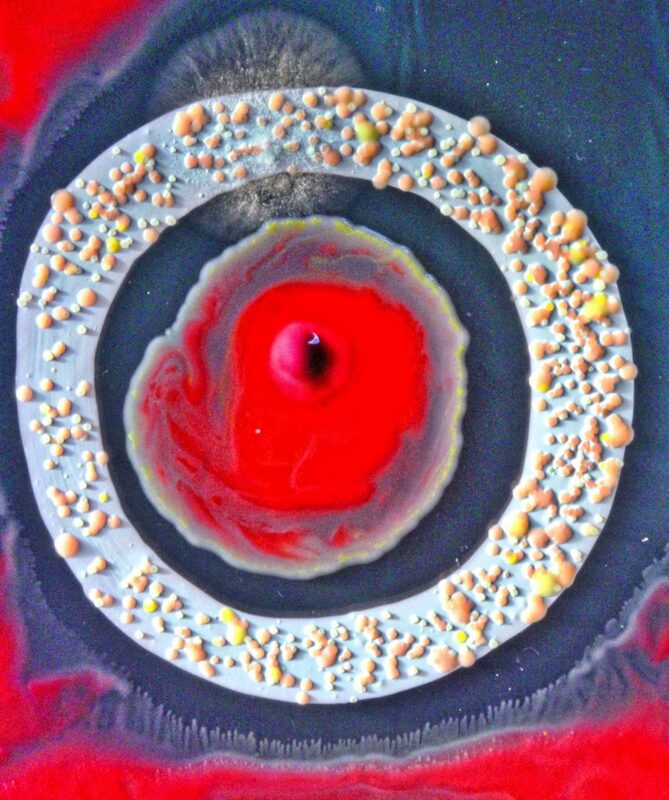 An example of this autogenic practice was a collaboration with watercolour artist Sarah Roberts, and the naturally red pigmented bacterium Serratia marcescens (Figure 3). The project began with Sarah making bespoke water colours containing pigments but in addition also designed to either encourage or inhibit bacterial interaction with the paints. Sarah then painted onto the surface of bacteriological growth media with her paints and S. marcescens as a living red pigment. When these systems are incubated overnight, it becomes clear that, not only does S. marcescens grow and swarm over the media, but it also interacts with, and moves Sarah’s watercolours across the medium in complex swirls and patterns, generating a biological form automatic and emergent form of art, with the bacteria playing a key role in the creation of the works (Figures 4A-D). Figures 4A-D. A creative collaboration with artist Sarah Roberts and the red pigmented bacterium Serratia marcescens. S. marcescens interacts with bespoke water colours on the surface of plate count agar to generate biological and autogenic art (A,B,C and D). 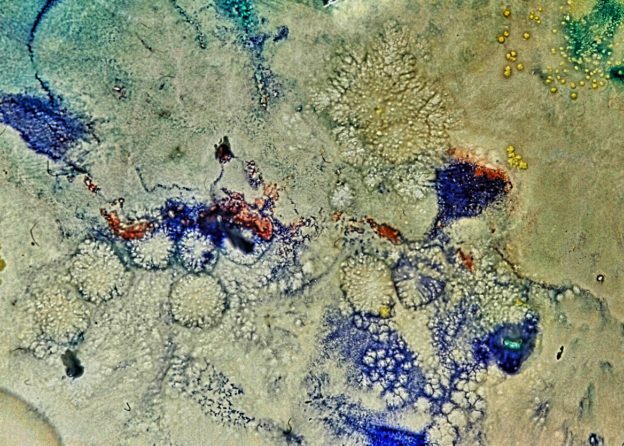 Colonies of bacteria from the artist’s skin microbiome grow within a white water colour. 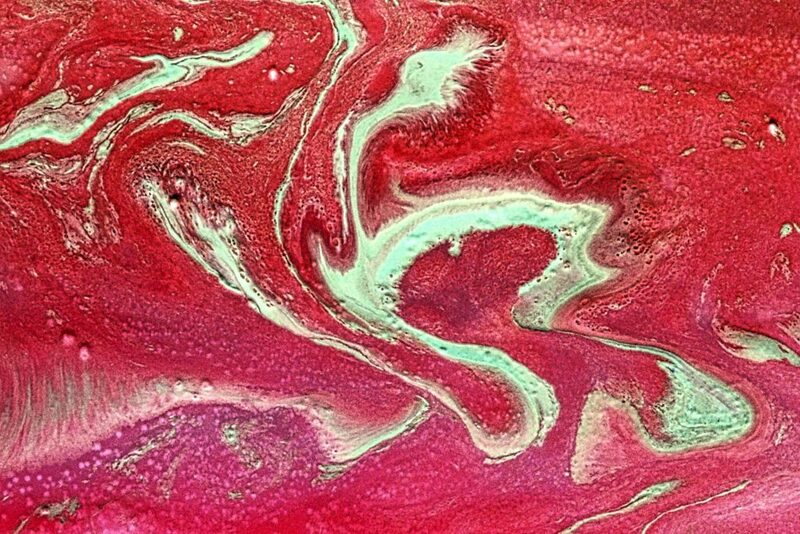 These striking and bacterially generated paintings are also a manifestation of our modern scientific understanding of the complexity of bacterial behaviour, how bacteria swarm, communicate with each other, move together in a coordinated manner, form biofilms, and build channels to irrigate large and complex bacterial communities. In an unexpected twist, bacteria make another unexpected contribution to the works here, and add a unique human dimension to them. 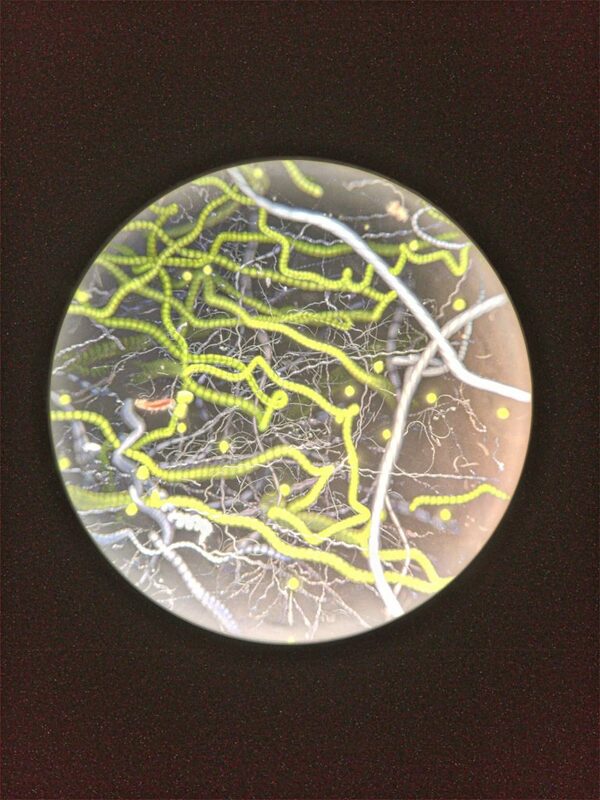 In this context, unbeknownst to us at the time, some of Sarah’s watercolours contained their own bacterial flora and when these cells were painted onto the receptive agar surface, these bacteria grew as obvious yellow, pink and white colonies within Sarah’s white pigment (Figure 4D). These colonies are formed by three species of bacteria namely, Staphylococcus epidermidis (white), Micrococcus luteus (yellow) and Micrococcus roseus (pink), which are very common members of the human skin microbiota, and thus in all probability are part of the artist’s microbiome. Historically, what we consider to be “self” is usually restricted to the collection of 40 trillion or so eukaryotic cells that derive directly from the 22,000 genes of our own human genome. However, the “omic” technologies of the 21st century are radically redefining this view of ourselves, so that “self” can now be seen to extend beyond the traditional precinct of our visible form, and to now include our resident bacterial community. In fact, our bacterial aspect (the microbiota [its cells] and the microbiome [its collective genome]), containing maybe as many as 100 trillion normally invisible cells, and 2 million microbial genes, is at the very least equal to our own eukaryotic biology in terms of cell numbers. The microbiota associated with the human body is undoubtedly vast in terms of numbers, but a number of recent studies have also begun to reveal its importance in modulating our health too. Bacteria in the gut, for example, have been shown to be capable of influencing the production of powerful neuroactive substances such as serotonin. Moreover, in animal models, it has been shown that bacteria play a crucial role in inducing, and preventing, abnormal mental behaviours like anxiety and depression. It seems very likely now that our own microbiota plays an important role in modulating our own moods and behaviour and this raises an intriguing concept concerning the role of the human microbiome as a co-collaborator in all works of art made by humans, in terms of it being able to influence the mood and health of the artist. Taking my inspiration from this, and from the appearance of Sarah’s microbiota in our collaboration above, I decided to give this usually invisible aspect of myself the opportunity to paint, and to express itself, away from my conscious intervention. In order to do this, I isolated bacteria from my own microbiota and mixed these with traditional watercolours (red, green and blue). 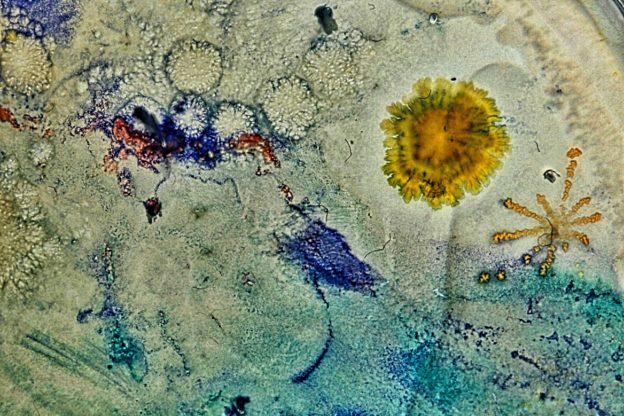 Left overnight, in a warm incubator set to human body temperature (37 C), the bacteria grow, travel, and interact with the paints, and in doing so move the watercolours around the medium, similar to the way that an artist might paint. 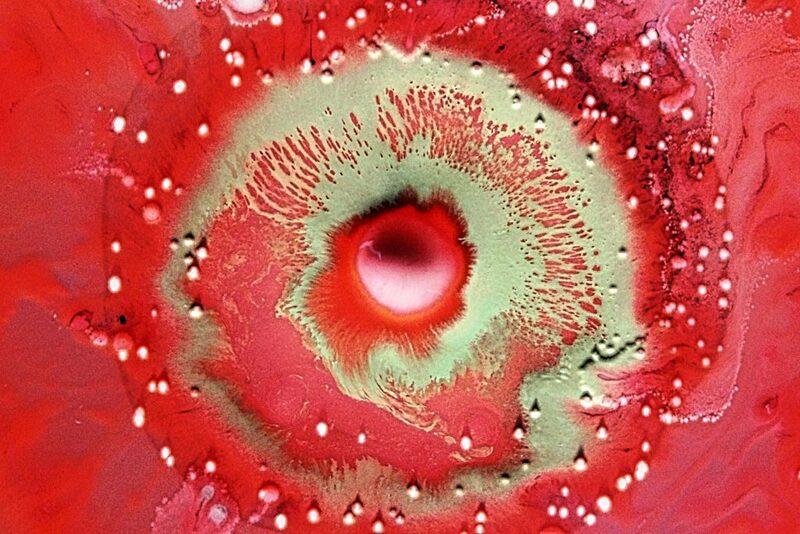 The paintings thus become unique self-portraits, being a direct manifestation of the complexity, power, activity, and the collective agency of my other bacterial self. Figures 5A-B. 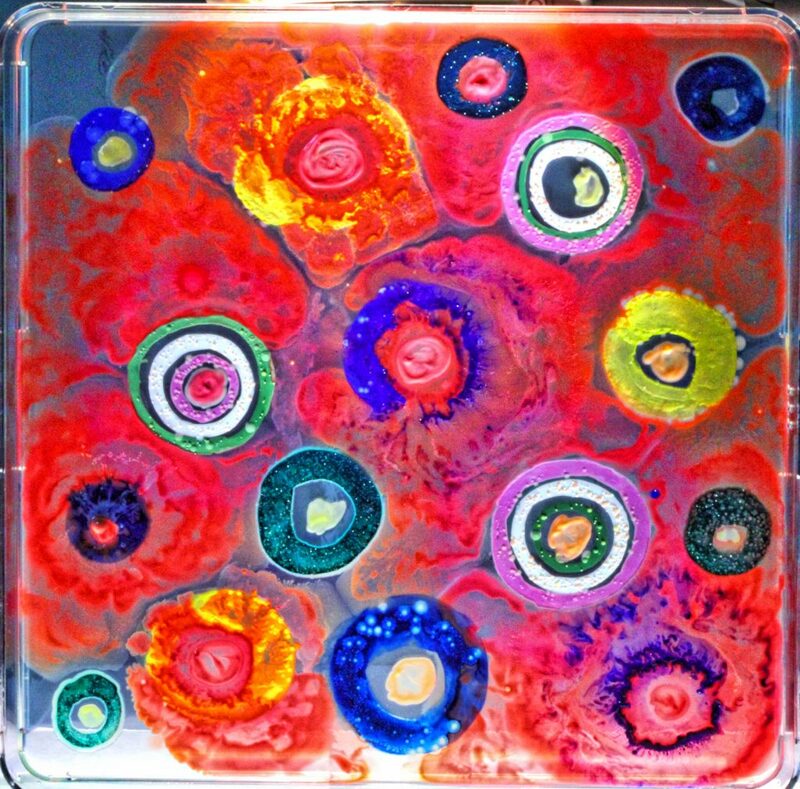 The microbiomal paintings. Bacteria from my own microbiome (mouth and gut), interact with red, blue and green water colours to generate a unique type of self-portrait.